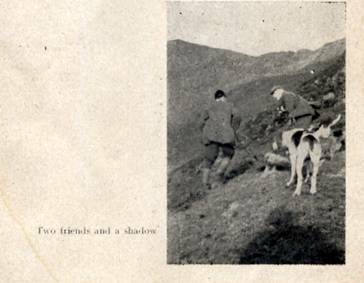 Blencathra Leaflet by Hunts Association 1950? The fell hounds of the famous Blencathra Hunt, under their grand old Master Mr John Crozier, on one occasion ran a fox from Skiddaw to Coniston and covered 35 miles in the course of a hunt. That is just one of the many quotations from the old hunting reports and the more that one reads of fox hunting in the fells during the 19th century, the more is one forced to the conclusion that the Blencathra Hunt owes a great deal of its fame to the prowess and high traditions which John Crozier set up so may years ago. The Blencathra is, of course, one of the five well known foot packs of the fell country and is called locally “John Peel’s“pack because they cover the territory hunted by John Peel and in the pack are many hounds descended from famous hounds hunted by John Peel and the territory covered by the hunt, which lies in Cumberland, adjoins the Cumberland Hunt on the north; the Melbreak on the west and the Ullswater on the south-east. It is practically all mountainous country and the foxes there are wild, strong and plentiful. The best centre is Keswick. 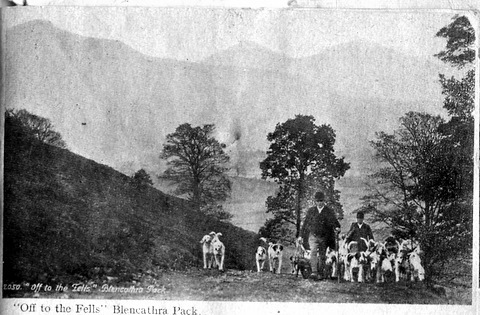 Hunting with the fell packs, such as that of the Blencathra Hunt, is a much different type of venery to that practised in other parts of Britain. 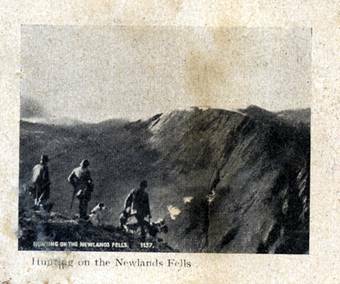 It is hunting in the hard way, to use a well known phrase, and only the fittest of sportsmen can expect to enjoy hunting in such mountainous and craggy surroundings. By that, I mean the man who follows hounds as best he can at all levels on his two feet; and even then he may be unlucky and not be able to see a lot that goes on during the day’s hunting. The subscription is small and the sport shown is of a high order – but the fitness of the followers of fell hounds is traditional, like many other things in that wild country. In High Leicestershire and the other ‘fashionable’ hunt countries, it is usually the man with the most expensive hunter that sees most of the sport – provided, of course, that he can really ride his most expensive mount ; whereas in such countries as the Blencathra, all the money in the world will not get you up with the hounds – only your physical condition and the manner in which you are shod count, apart from a knowledge of the country, which applies to any hunt but especially so to the fells. The pageantry of the southern hunts is missing from those of the fells, where only the scarlet coat is that worn by the huntsman [and that probably not renewed too often!] Horses, as I have indicated, are quite out of the question and to hack on to the meet a follower must use his own two feet or a cycle. 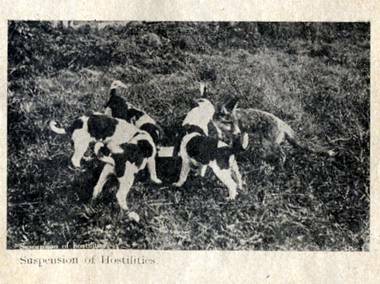 It has been said that the fell packs were really instituted in order to protect sheep and more particularly lambs, of which the bold mountain foxes were wont to take heavy toll; but one surmises that the instigators had their eyes on a bit of sport at the same time, and the famous hare-footed fell hound thus became a dual-purpose animal. Quite apart form the great sport shown by such hunts as the Blencathra, every day’s hunting becomes an adventure in view of the nature of the country to be drawn and over which hounds run. The grandeur of the scene; the stiff climbs up steep slopes of grass or scree; sudden heavy rain or mist that may blot out everything; icy winds and the rest of the elements. All these can be encountered on the high ground, but the hardened follower will put up with every discomfort so long as he can remain in contact with hounds. For even on the calmest of sunny days, the pack may continually elude most of the field who may get far better sport in less comfortable circumstances. But now to refer to the earlier days of the Blencathra and of that John Crozier and his sire in particular--- for in them the Hunt had its being. 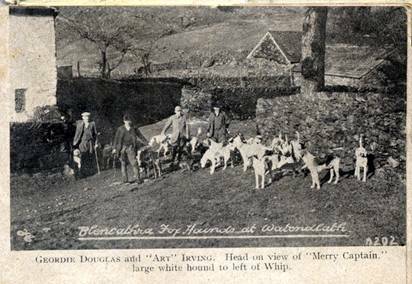 At the close of the 18th century, John Crozier’s father who dwelt at Gate Ghyll farm, kept a few couple of hounds including some belonging to John Peel. They were then known as the Threlkeld Hounds. Mr Crozier senior next bought the Riddings and removed the pack there –and the Blencathra as they are now known have been kennelled there ever since. John Crozier the younger was born in 1822 and his father handed over the pack to him while John was still a young man. 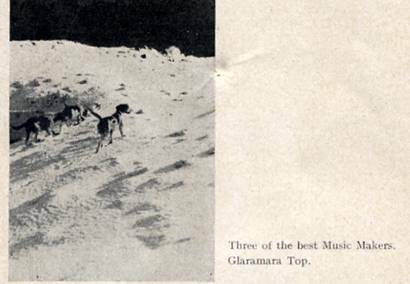 From that time, john maintained the pack at his own expense for the next 30 seasons, at the conclusion of which period the Blencathra became a subscription pack – in 1890 or thereabouts. 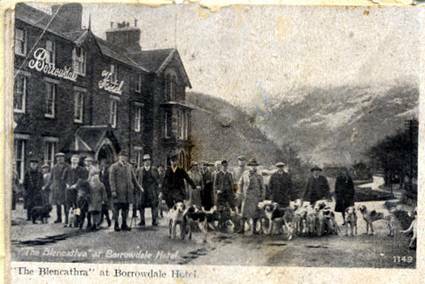 A public meeting had been held at Threlkeld at that time, when Mr John Crozier was re-elected Master of his old hounds, being assisted by a Committee of seven members; the Hon Sec being Mr Robert Mayson, a member of a most sporting family long connected with the Hunt. The agreement drawn up included the reservation that if ever subscribers gave up hounds, the pack was to revert to the Crozier family. As a matter of historic interest, that agreement was signed by J Crozier, R Mayson, J Fisher, Crosthwaite, T Simpson, T Ewart, R R Lowthian, H A S Spedding, P Crosthwaite, Joseph Wilkinson and Joseph Mandale. No praise can be too high for John Crozier as a sportsman and Master of Hounds; he received a fine piece of plate from 200 subscribers in 1866 to celebrate his 26th season as Master, while some ten years previously he had received a present from the flockmen in the Blencathra district. One may read in the records that some 50 years ago, fifteen couple of 20-23 inch hounds were kept and a number of Lakeland terriers, several of those hounds having the blood of John Peel’s pack. Puppies were walked by farmers and shepherds (as many still are!) and the Hunt occasionally obtained drafts from Dallam Tower and from Lord Leconfield. Hill foxes in those days scaled up to 29lbs. and many great runs were scored. In the 1900-1 season, to give an instance, 70 foxes were killed, the normal hunting pack then consisting of 12 couple. Hunting commenced in early October and continued until April or later. Famous huntsmen of the earlier seasons, who are here recalled, include Joshua Fearon, Isaac Todhunter (25 seasons), Johnny Porter (26 seasons) and then Jim Dalton, of Caldbeck. Earlier Hon. Secretaries include, (besides Mr R Mayson), Messrs. Jacob Howe and Thomas Mayson, Mr William Mayson and the memorable Mr George Tickell. The last named gentleman, a typical fell sportsman, was Hon. Secretary for 14 seasons and also acted as Deputy Master for a number of years. His bearded figure in tweed cap, jacket and breeches, was ever familiar for some 70 seasons of the Blencathra history. I am indebted to Mr C Rigg, the present Hunt Secretary, for the information which he has kindly provided to assist me in the preparation of these notes. 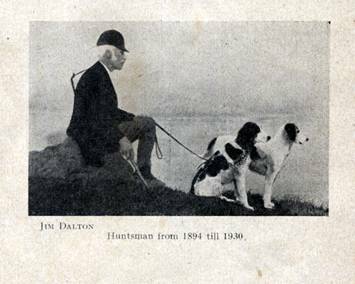 To continue the Hunt history, Mr John Crozier held the mastership until 1903, with Jim Dalton as his huntsman for the last nine seasons. The whipper-in was then Tom Hutchinson and hounds were taken out three days a week; only 12 & ½ couple being kept at the Riddings. The minimum subscription was 2/6. From 1903 until November 1919, the Rt Hon J W Lowther, the Speaker of the House of Commons held the mastership in succession to Mr John Crozier, having first Mr H Howe as his Deputy Master and then Mr George Tickell. Jim Dalton remained as huntsman and from 1907, Mr T Crosse was Hon. Sec. 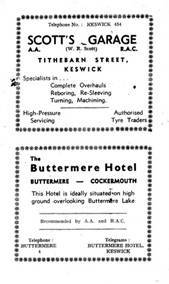 Mr R J Holdsworth of Seathowe, Thornthwaite, became the next Master and had Mr A W Anderson as his deputy. M J Harryman was his Hon. Secretary, while Dalton remained to hunt the 15 couple three days a week, with Ernest Parker to turn hounds to him. Subsequent secretaries of the between war period were Mr D Paisley and Mr Robert Devon. In 1927, Mr John Tatters took over the office of Deputy Master and matters remained the same until 1937, when Mr Tatters took over the mastership and Mr Holdsworth became Hon. Master. Meanwhile, in 1931, George Bell had been put on as huntsman and made a great job of it. 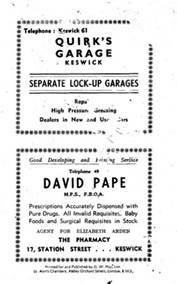 He first had A Benson and Mr D Paisley as his whippers-in; A Irving replacing Benson in 1937. It was in 1945 that the present Master Lt. Colonel P M Hope, of Keswick, began his successful term of office, with George Bell continuing to hunt the pack of some 15 couple. J Richardson was whipper-in until 1949, when he was put on as huntsman. The Hon. Joint secretaries since 1945 have been Mr C Rigg, of The Crossings, High Hill, Keswick, (phone : Keswick 463 ), and Mr J Hume, Crown Inn, Keswick, with Mr J Iredell as Hon. Treasurer. Sport has always been first class with Blencathra and the high standard has been maintained during recent years. 1946-47 was a capital season with 80 foxes killed and many cubs. 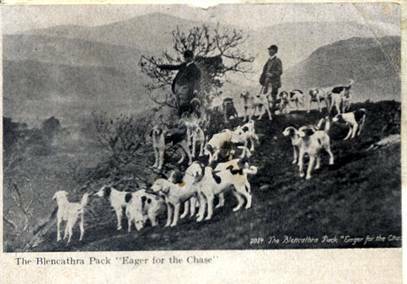 There was a great revival in hunting in the fells and many visitors came to hunt with the pack. In the following season, the excellent sport continued, hounds killing 137 foxes, including cubs, while there were record numbers of members and subscribers. In 1948-49 the tally was 115. When Richardson was made huntsman, Ronald Cape was appointed as whipper-in. The scarlet coat is worn by the huntsman only, while the whipper-in sports a red collar and cuffs. The present subscription is 2/6 to £5. Mr Robert Devon, Hon. Secretary 1924 – 1946, at time of death Deputy Master 1950. New kennels bought in 1945, which are adjacent to original home of pack, i.e. Gate Ghyll where Crozier kennelled his hounds and where the pack was originated.